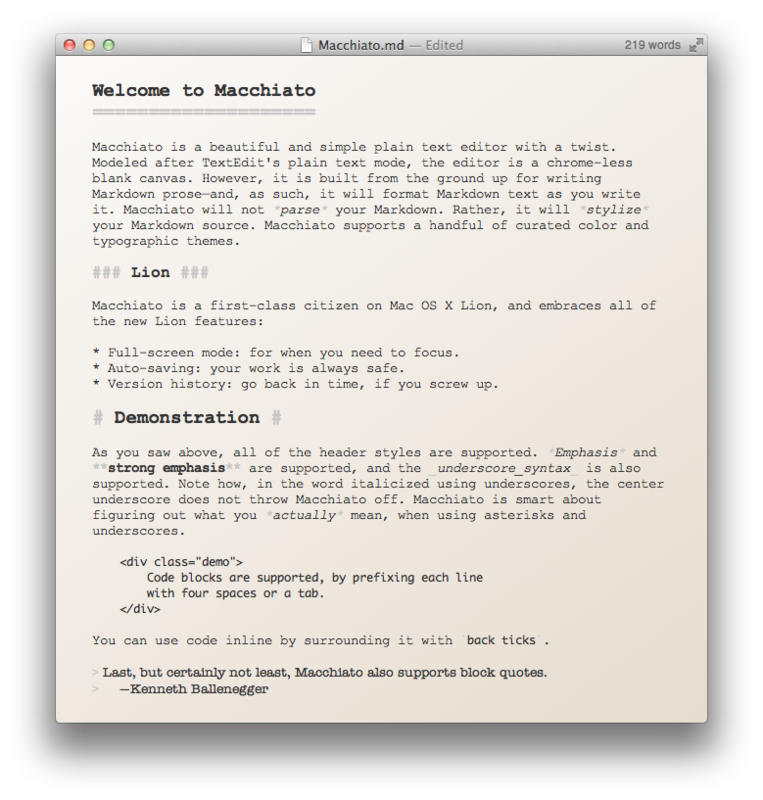 Macchiato is a simple plain text editor with a twist. Modeled after TextEdit's plain text mode, the editor is a chrome-less blank canvas. However, it is built from the ground up for writing Markdown prose—and, as such, it will format Markdown text as you write it. Macchiato will not parse your Markdown. Rather, it will stylize your Markdown source. Full-screen mode: for when you need to focus. Auto-saving: your work is always safe. Version history: go back in time, if you screw up. As you saw above, all of the header styles are supported. Emphasis and strong emphasis are supported, and the underscoresyntax_ is also supported. Note how, in the word italicized using underscores, the center underscore does not throw Macchiato off. Macchiato is smart about figuring out what you actually mean, when using asterisks and underscores. with four spaces or a tab. You can use code inline by surrounding it with back ticks.